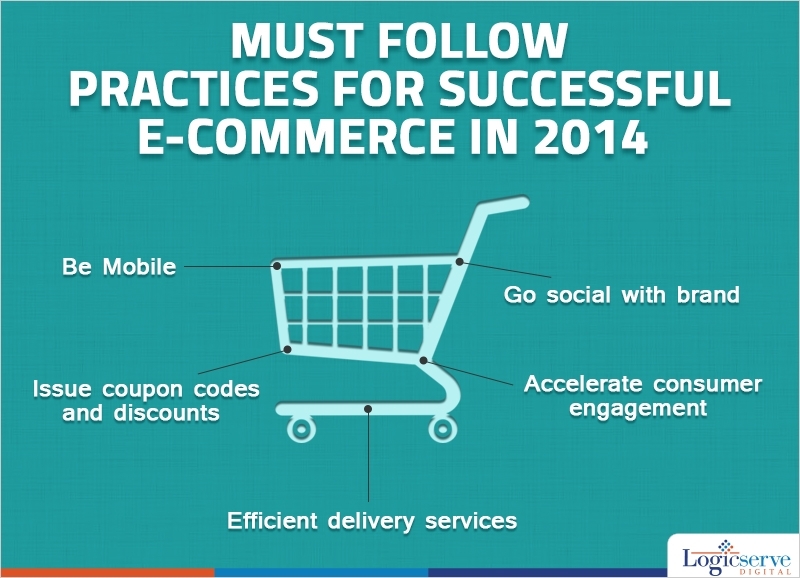 Growth and Trends in e-commerce India 2014 - Key factors for e-retailers to concentrate on!! Growth and Trends in e-commerce India 2014 – Key factors for e-retailers to concentrate on!! Apart from metros, people residing in Tier II and Tier III cities are accessing the Internet through their mobile phones to browse and shop online. This growing trend presents every e-commerce site with ample number of opportunities to reach out to consumers. While being online is the key factor for growth, here are a few pointers that can help every e-commerce portal post their initial set-up. Be Mobile – The availability of 3G services, cheap broadband plans, affordable smartphones and the purchasing power has lead to Indians being highest users of mobile phones across the world. Surprisingly they have begun to access the Internet through the phone for shopping which means your website should be mobile friendly. Delivery Services – Flipkart gained popularity amongst nascent Indian online shoppers by offering them free delivery on their purchases. Over the time, free deliveries were restricted to billings above a predetermined amount. With the foray of Amazon and other growing Indian e-retailers, the race to deliver first has got even more competitive as customers can enjoy multiple delivery options. Online retailers have expanded their areas of delivery to include Tier II and Tier III cities along with Tier 1 cities. Customer Support and After Sales Service – After-sales is the key once the consumer receives your product. Online retailers have to offer hassle-free options and quality customer support to consumers whereby they can return the goods if they are unsatisfied with them. This generates a feeling of trust amongst customers. Once the level of trust is gained, customers will feel confident about ordering higher value items such as refrigerators, microwaves, other home appliances, and even more expensive jewellery products online. Currently, India is witnessing a transition towards online shopping which can be capitalized by offering attractive discounts, bargain offers, freebies and much more to online shoppers. Coupon codes and different deals can be designed in collaboration with specific brands or coinciding with festive occasions. If you are looking for an example, you could browse through www.couponraja.com, India’s premier coupon aggregator on latest coupon deals and offers including some exclusive ones. Targeted Customer Segment – The ASSOCHAM report predictably shows how the youth segment (18 to 35 years age group) dominates online shopping in India. The items that get sold and bought online therefore cater to this youth segment. The same demographic is the predominant user of both social media (Facebook, Twitter and Pinterest) and online shopping portals. Active Social Media Presence – An Active social media presence extends to more than just creating a page or a profile. It is essential to interact with customers, acknowledge their posts, offer useful tips and guidelines through social media platforms and others help you to build up customer engagement, an absolute must in today’s digital market space. In short, be there and be proactive. While there are 900 million cell phones in India, the number of mobiles connected to the internet is no more than 150 million. As Internet penetration via mobiles grows in India, more and more people will continue to buy gift items, electronic products, accessories, apparel, computers and peripherals online. Wondering how engaging is mobile technology vis-a- vis online shopping in the Indian scenario? Well as of now, Android and iOS apps of Couponraja and Compareraja have crossed the 20,000 mark in downloads month after month post their formal launch.